John D. Van Ackeren is a Senior Trial Attorney with Callahan & Blaine. Mr. Van Ackeren's practice focuses on complex litigation matters, including business, insurance, real estate, and employment matters. He has extensive experience litigating cases from inception through trial in both state and federal courts. Throughout his career, Mr. Van Ackeren has successfully prosecuted and defended cases for clients ranging from individuals to Fortune 500 companies. 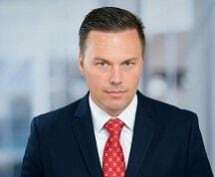 From 2013 through 2018, Mr. Van Ackeren has been named to the Southern California Rising Stars list by Super Lawyers Magazine, an honor bestowed on only 2.5% of the attorneys under the age of 40. Obtained judgment in favor of bank and director clients on all counts in shareholder fraud class action following lengthy trial. Successful defense of partner in multi-million dollar partnership dispute. Obtained six figure settlement for homeowner in HOA dispute after successfully opposing Anti-SLAPP motion. Successful defense of multi-million dollar oil spill pollution case. Obtained attorneys' fee award in excess of $1.3 million dollars following trial. Obtained dismissal of real estate investor at pleading stage in breach of contract and fraud case. Obtained dismissal of commercial construction lender at pleading stage in fraud action. Litigated bad faith claims on behalf of policy holders with respect to property damage and loss caused by natural disaster, resulting in favorable settlements. Obtained summary judgment for construction products company in product liability action. Negotiated favorable settlement for majority shareholder in fraud, breach of fiduciary duty, and dissolution action. Negotiated nominal settlement for staffing company in multi-million dollar wage and hour class action.